Depending on the purpose of deep mixing, a number of different patterns of column installations are used see Figures A.8 to A.11. If the main purpose is to reduce settlement, the columns are usually placed in an equilateral triangular or in a square pattern. If, on the other hand, the purpose is to ensure stability of, for example, cuts or embankments, the columns are usually placed in walls perpendicular to the expected failure surface. Overlapping of the columns is particularly important when the columns are installed for containment purposes. 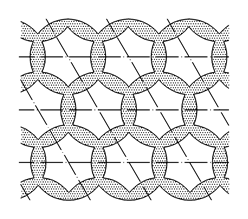 Overlapping is normal in block type, wall type and grid type installations. 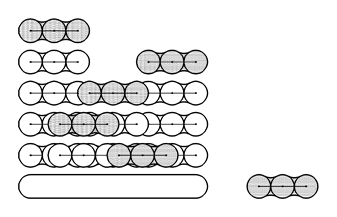 An example of the installation sequence in overlapping columns to create interlocking walls is given in Figure A.12 installing the columns in some U-formed, elliptical or circular patterns form effective barriers against horizontal actions of various kinds (earth pressure, slip surface, etc.). There are several methods, which use techniques reminding of deep mixing. These methods, which in this context are named hybrid methods, are continuously under development to tackle particular ground conditions and foundation problems. They typically combine hydraulic and mechanical mixing. Here, some of the hybrid methods, which have found use and acceptance among contractors are described, such as mass stabilisation, jet grouting combined with mechanical mixing, etc. In cases where the soil conditions are very bad, e.g. peat, gyttja or organic clay and soft clay deposits, mass stabilisation can be required, in which the whole soil mass is treated down to a depth of normally 2 m to 3 m. The maximum depth of treatment presently is 5 m. The mass stabilisation machines differ essentially from the column stabilisation machines . The binder is fed to the mixing head while the mixer rotates and simultaneously moves vertically and horizontally. Mostly the mass stabilisation machine is a conventional excavator but equipped with a mass stabilisation mixer. Two types of mass stabilisation technology are shown in Figure A.13. A new method, combining the advantage of mechanical mixing with jet grouting, has been developed. These machines have a mixing shaft as well as jetting nozzles, capable of creating columns larger than the mixing tool diameter. Jet stirring also makes it easy to create overlapping of the treated columns. The diameter of the columns can be varied by either jetting or no jetting. 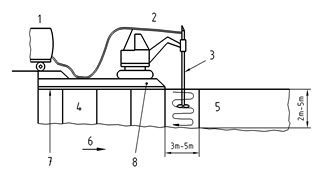 The jet grouting technique is described in detail in EN 12716,  and . A new type of low-displacement deep-mixing method has been developed in Japan for the purpose of minimising lateral displacements during construction. Accordingly, an earth auger screw is installed on the upper part of the mixing shaft to remove the soil to the ground surface. By removing a soil volume equal to the volume of injected cement slurry, the displacement of surrounding ground or nearby structures can be reduced  and . The Cut-Mix-Injection (Fräs-Misch-Injektionsverfahren) is a German method by which loose soil can be mixed with cement slurry and homogenised in deep strips by means of a special machine, in German named Fräsmaschine. The off-road capable, caterpillar track-driven FMI-machine comprises driver cabin, power train and cutting tree. The cutting tree, on which the cutting blades are rotated by two chain systems, is driven towards the driver cabin. It is inclined up to 80°, is dragged behind the machine and can be positioned perpendicularly to the operational direction. Due to special configuration of the blades, the soil is not excavated but mixed in-situ with cement slurry. 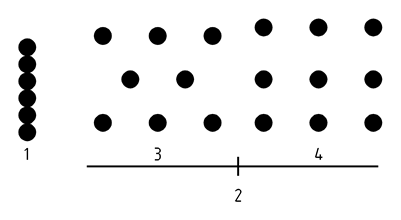 Driving speed, cutting depth and rate of cement injection are computer controlled. The cutting tree is provided with injection pipe and injection outlets. The cement slurry is mixed at a separate site and distributed to the cutting tree via the injection pipe. The average supply of slurry is 100 m3/h. 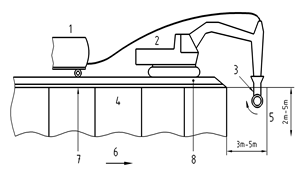 The method makes it possible to treat the soil to a depth of maximum 9 m. The cutting width amounts to 1,0 m down to a depth of 6 m and 0,5 m down to a depth of 9 m .
The possibility that the execution of deep mixing will cause ground displacements, affecting stability condi- tions of slopes or causing problems with sensitive structures, need to be considered. 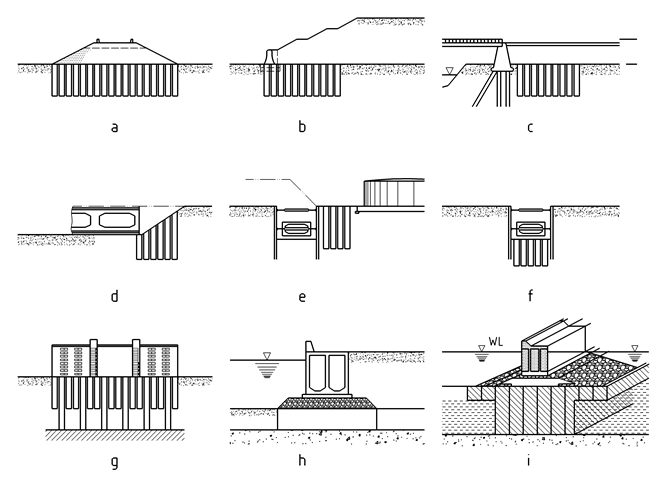 Examples of the use of deep mixing for the purpose of settlement reduction and improvement of stability, for prevention of adverse effects on adjacent structures and as a supporting wall in deep excavations are given in Figure A.14. The chemical reactions between the soil and the binder generate an increase of the ground temperature, which goes on until the chemical reactions are terminated. The operation of the mixing equipment need to be carried out with due consideration of safety restrictions. The reaction between unslaked lime and air humidity or water is highly exothermic. The resulting rapid volumetric expansion and heat generation may lead to fire or explosion. It is caustic and toxic and, as a precaution, tight eye-shields should be used as well as protective gloves and mask. Also cement is caustic. 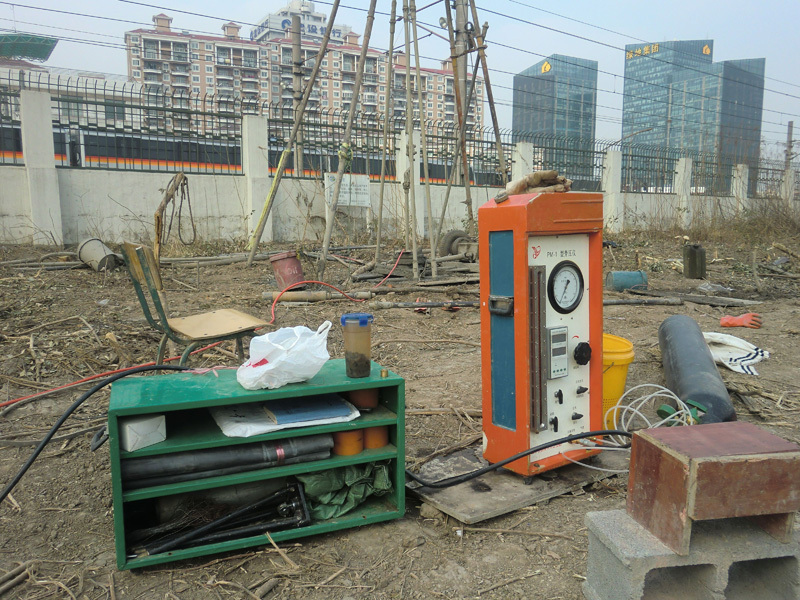 The engineering case, Shanghai Minhang pressuremeter test.